This rare design glass bead necklace represents elegant Art Deco craftsmanship. Excellent - The necklace has been professionally re-strung. 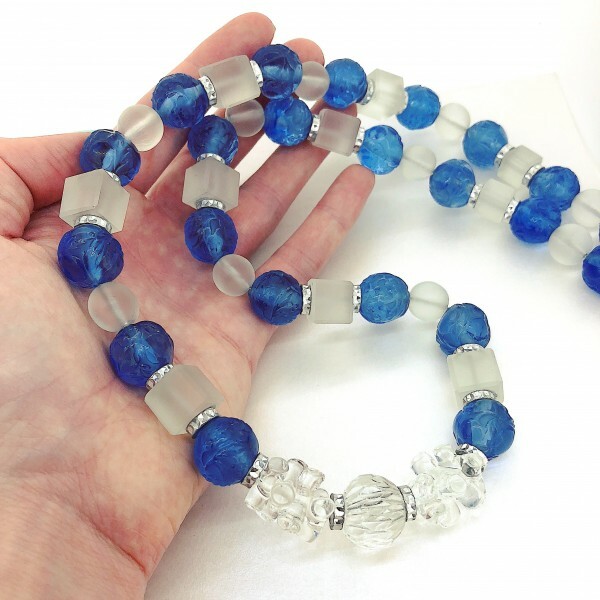 This necklace features round and cube shaped frosted glass beads, blue round glass beads carved with floral patterns and cut metal rondelle beads. At the centre of the necklace are clear glass 'spikey' beads and a round, multi-faceted clear glass bead. The necklace fastens with a large, sterling silver bolt ring - this was a recent addition to the necklace when it was professionally re-strung to increase its strength. This necklace measures 70cm in length. Glass has been a prevelant feature of costume pieces since the invention of jewellery. An easily accessible material that can be formed into any shape and dyed any colour. Glass was heavily used in Art Deco pieces, such as this necklace, because it could be dyed in a vast array of colours to meet the need for affordable jewellery after the Great Depression and First World War. It could also be formed into a variety of shapes to created the geometric designs popular during the Art Deco era. This necklace looks classic and elegant paired with a deep black roll neck knit and grey wool trousers.